Laundry | Housing and Residence Life, U.Va. 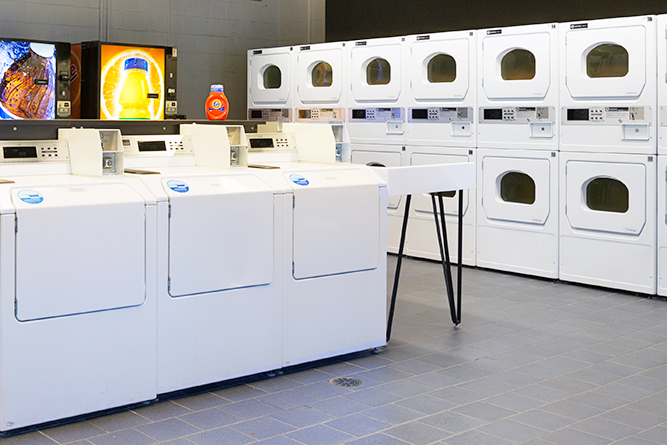 Whether you are an undergrad, graduate student, or a member of the faculty or staff, laundry facilities are available to you as part of your on-Grounds housing. Please see the category below that applies to you for some of the most commonly asked questions about laundry. If your question is not answered below, please contact us. Laundry facilities are also located in each of the upperclass areas and in language houses. How do I pay for laundry? Laundry machines in undergraduate housing areas accept payment using your University ID card through Cavalier Advantage. The cost for the 2017-2018 academic year is $1.75 per washer or dryer cycle. How do I report a broken machine? The laundry facilities offered by Housing & Residence Life are currently contracted to Caldwell & Gregory, Inc. Any machine malfunctions or loss of money should be reported to Caldwell & Gregory, Inc. at 800.927.9274 (800.927.WASH). This number is also posted in the laundry rooms. You can also report issues to service@caldwellandgregory.com. If you think you were charged twice or need a refund, please email cavadv@virginia.edu for assistance. Can I check the status of washers and dryers from my room? The CSGold Laundry Room Status website allows undergraduate housing residents to monitor the status of washers and dryers in the residence halls from the comfort of their own computers. Students can find available machines, see expected wait times on machines that are currently in use, and sign up to be notified by email or text message when a cycle completes. When is the best time to do laundry? Generally, mornings and early afternoons are good times to do laundry! If use times are staggered, you will usually have no difficulty finding available machines. You can help keep machines free by promptly removing your clothing when your load has finished. The time for a washer load to finish varies based on the cycle you choose, and there is a time display on all machines that tells you how long the cycle will run. A dryer load normally takes about an hour. Our undergraduate residence halls contain front loading washers. We recommend you use H-E (high-efficiency) detergent. Liquid detergent pods/packs typically contain H-E detergent and are fine for use in these types of machines - just make sure you put pods or packs in the door, not the drawer. Are wash/dry/fold laundry services available? Yes! Housing & Residence Life has partnered with approved vendor University Cleaners if you are interested in weekly wash, dry, and fold services. Please visit uvalaundryservices.com to learn more. Laundry facilities are located on the basement floors of all apartment buildings in Copeley Hill and Piedmont Apartments. The laundry rooms at University Gardens are located in the basement of buildings 85 and 126. All laundry must be washed in designated laundry rooms, not in sinks, bathtubs, or in-apartment washing machines (which are on the prohibited items list and can result in termination of your stay in University housing). The only exceptions are housing units where the washing machine is furnished by Housing & Residence Life. Do I need to pay for laundry? Machines in graduate and faculty/staff housing areas accept only "Clean Cash" laundry cards. These cards are issued to all residents at check-in and must be returned to Housing & Residence Life when residents move out. Single residents are given a green card that has an allotment of $31.50 per month. This amount allows for 9 loads monthly (9 wash and 9 dry loads, or any combination up to 18 loads). Families are given a red card that has an allotment of $49 per month. This amount allows for 14 loads per month (14 wash and 14 dry loads, or any combination up to 28 loads). What if I need to do laundry after I've used up my allotment for the month? If you require more loads than the laundry allotment will cover, you can come to the Housing & Residence Life offices in Gibbons House during regular business hours to purchase additional loads. Housing & Residence Life is open 8:00 a.m. to 5:00 p.m., Monday - Friday (except University holidays). What should I do if I lose my Clean Cash card? If you lose your card, please report the loss to housing@virginia.edu. Our office will de-activate the lost card and make arrangements for you to pick up a replacement card at Gibbons House. For single-resident (green) laundry cards, the replacement cost is $41.50. For family (red) laundry cards, the replacement cost is $59. The replacement cost will be billed in the same way as your monthly rent.